The design and navigation of your nonprofit’s website to ensure that the aesthetic and functionality is compatible with today’s online donors and supporters. The design and layout of your e-newsletter in order to maximize online fundraising success and social media ROI (Return on Investment). Your nonprofit’s online donation process – from clicking the “Donate Now” button to receiving the follow-up “Thank You” email – to make certain that your nonprofit is not making simple mistakes that could be costing your nonprofit thousands of dollars in lost donations or social media ROI. The design and content of your nonprofit’s blog. Successful blogging can significantly increase your nonprofit’s online brand recognition, your fundraising success, and social media ROI, but unfortunately many nonprofits still launch and maintain a blog utilizing outdated blogging best practices. Your nonprofit’s presence on Facebook, Twitter, YouTube, Pinterest, Google+, and other social networking websites. Heather will like, follow, and subscribe to all your communities and analyze the quality of content being posted and the “voice” behind your nonprofit’s avatar, as well as the design and utilization of the tool set of each site. Additionally, suggestions for social networking sites that your nonprofit is not yet active on, but should be, will be made. If desired, suggestions can also be made about how your nonprofit can begin to launch a mobile communications and fundraising strategy. Each audit requires an average of 15-20 hours spent researching and reviewing your nonprofit’s online presence and another 5-10 hours preparing the PowerPoint for the webinar or in person presentation. The cost to present the audit via webinar is $2,000 and in-person is $2,500 plus travel expenses. 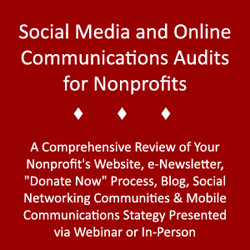 If the audit is presented in-person, an additional two-hour training on social media best practices for nonprofits is offered. All attendees of the audit are sent a follow-up set of notes and all audits include a 90-miunte consultation via telephone at a later date for follow-up questions or discussion. For more information or to reserve an audit, please contact Heather Mansfield at heather@diosacommunications.com. Please note that due to a heavy webinar and training schedule, Heather can only schedule one or two audits per month.